Just in time for the holidays, NYC ABC has added several posters, including the handsome one to the left, to our online store. Visit gumroad.com/nycabc to check out the posters, as well as t-shirts, tote bags, or to donate to project FANG. All posters will be sent via first class mail, in durable poster tubes. Make sure to enter the code “localpickup” if you want to get the poster(s) from us in person (maybe grab it at our every-other-week political prisoner letter-writing dinner?) and save on shipping. All funds raised go directly to supporting U.S. held political prisoners and prisoners of war. 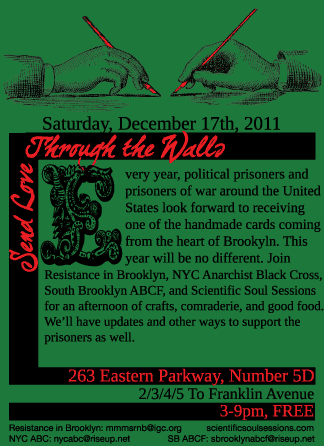 In what many prisoners have told us is their favorite event of the year, Resistance in Brooklyn and NYC Anarchist Black Cross again join forces to bring you the annual holiday card-writing party for U.S. held political prisoners and prisoners of war. This event is always a lot of fun, the food outstanding, the camaraderie lively, and the handmade cards flat out amazing. This year will be no different. So plan to bring your friends, your creativity, and a healthy appetite. We’ll have updates on the pp/pow campaigns as well as paints, markers, crayons, and envelopes. Walk west on Eastern Parkway (away from Franklin Avenue, toward Classon Avenue). We’re about half a block down on the north side of the street. When you go into the building, take the elevator to your left.